Matthew 9:28When he entered the house, the blind men came to him; and Jesus said to them, ‘Do you believe that I am able to do this?’ They said to him, ‘Yes, Lord.’ 29Then he touched their eyes and said, ‘According to your faith let it be done to you.’ 30And their eyes were opened. Then Jesus sternly ordered them, ‘See that no one knows of this.’ 31But they went away and spread the news about him throughout that district. I was paused at two words in today’s gospel reading, ‘sternly ordered,’ perhaps because that kind of admonishment coming from Jesus on the heels of a healing just feels wrong. A sense of shame is suggested which feels entirely awkward and inappropriate. Isn’t healing a good thing – good news? I was curious about the frequency with which the adverbial clause ‘sternly ordered’ was used in scripture and found 25 instances. The exact wording occurs only in the synoptic gospels. And nearly all of the admonitions come from Jesus, directly. When said by Jesus, it is only in two situations: either when a healing has been performed or when with the disciples he self-identifies as the Son of Man, the messiah. In each instance where ‘sternly ordered‘ is said by Jesus after a healing – well, the order is disobeyed. That is, after Jesus sternly orders the healed person not to say anything, the word ‘BUT’ follows and the healed person disobeys and tells all. So ‘…sternly ordered, but….’ is the way it unfolds in most of the healing stories found in the synoptic gospels. Where the command is obeyed is in the instances that have to do with Jesus’ identity and what is to come. In several instances, Jesus sternly orders his disciples not to share the good news of the kingdom come. They are insiders who are told to keep the good news under wraps. Hmm. So, blind faith leads to sight and that good news trumps the command to mums the word. Once the feathers are released from the pillow, they can’t be stuffed back. All for everyone to see. When Jesus heals, that’s just the truth of the matter. I think I was paused at ‘sternly ordered‘ in order to think more deeply about belief and sight and how these manifest in my walk. To believe in Jesus, is to see Jesus in all things. And to see Jesus in all things, is to believe – to have faith – that wherever I am, whatever trial I am experiencing – whatever illness, brokenness, blessing – Jesus is with me each step of the way. I have to believe to see this – to see God’s hand upon me, leading me, whispering – but more than I’d like to admit, I have to see it to really believe it. There’s a sort of ying and yang to the idea of believing is seeing and seeing is believing. A teeter-totter is what comes to mind. At any given time I am on one end of the spectrum, then whooops…there I am up in the air on the other end. Like the blind men, I believe so I see God in the mix really clearly one day, but then the next I am up in the air, in the clouds, confused about everything and wondering why God doesn’t make himself known…let me see you in this mix, God, so I can believe I am on the right track! I think all believers teeter totter back and forth between the blind faith and trust of the blind men and the ‘seeing is believing’ faith of the disciples. 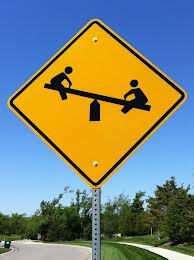 Do you know what the other word for teeter-totter is? Seesaw. Yup. SEE SAW. On one end of the belief spectrum I SEE God, I believe so I SEE…and on the other end, like the disciples who SAW it as it was happening – who SAW the kingdom come and so they believed. 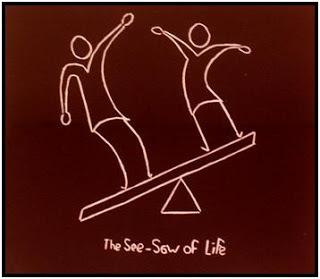 It helps to be reminded that no matter where I am on the SEESAW of life, God’s faith waivers not, is no such seesaw. Rather God’s faith in me is at the center…that little triangle – trinity – you see in the illustration to the right. God’s faith in me is there – at the center. Steadfast and at the core of who I am. This entry was posted in Whispers and tagged eyes, Faith, God, healing. Bookmark the permalink.